1. Mainstream and moderate Democrats delivered what voters wanted—and the majority. 2. Health care was key, but affordability and access eclipsed single payer. 3. The Democratic coalition wants a uniter, not a divider, in 2020. 4. A winning Democratic mantra: every American should be able to earn a good life where they live. The 2018 U.S. House election was a victory for America and for Democrats, led by women, people of color, veterans, and LGBT candidates. The new Congress will be the most representative in history. But what do the voters who sent these folks to Washington want them to do, and what can that teach Democrats as they look forward to 2020? 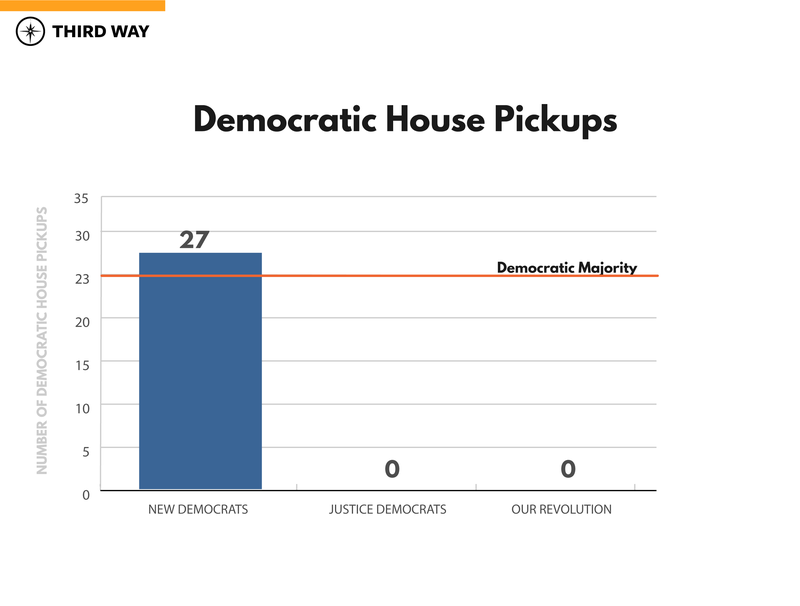 Third Way worked with David Binder Research to conduct an election-eve poll in Cook Political Report’s 72 battleground House districts, talking to those who had already voted and those who were certain they would vote on the weekend before Election Day. At the time of our polling, 68 of these seats were held by Republicans and four by Democrats. The results are particularly illuminating as the race to win the Democratic presidential nomination begins. What these data and the 2018 election results offer is a blueprint for defeating Trump and saving the country in 2020. The 2018 Democratic primary season offered an important opportunity for voters to weigh-in on the direction of the Party. Ultimately, mainstream Democrats prevailed over those farther to the left. We followed up on those primary results by asking Democrats and Independents (the voters who will choose the next nominee) a simple question: were they happy with the ideological orientation of the named Democrat running for the House in their district? A plurality in these 72 swing districts, 37%, said they would not have preferred a different choice. Thirty-five percent said they would have preferred a more moderate (21%) or conservative (14%) choice, while just 16% wanted someone more liberal. The poll also included an oversample in the handful of districts where Democrats nominated far-left candidates. In those places, a slightly higher 24% of these voters would have preferred a more moderate option, while another 13% would have preferred someone more conservative. Voters recognized that the pragmatic progressive Democrats running in their districts fit their communities and rewarded them with their votes accordingly. So it should be no surprise that candidates endorsed by the moderate New Democrat Coalition flipped 33 of the 42 districts that went from red to blue—making them the majority-makers. Conversely, it explains why candidates endorsed by the far-left organizations Our Revolution and Justice Democrats failed to flip a single seat from R to D.
These mainstream and moderate Democrats fit their districts not just because of their biographies or community ties, but because they championed the issues that voters cared about most. Fifty-one percent of all voters identified health care as one of their top two priorities this year; among Democrats, this jumped to 72%. When asked what the priorities should be for Congress next year, 81% (and 92% of Democrats) said reducing health care costs should be an extremely or very high priority. This priority matched what voters heard on the campaign trail. 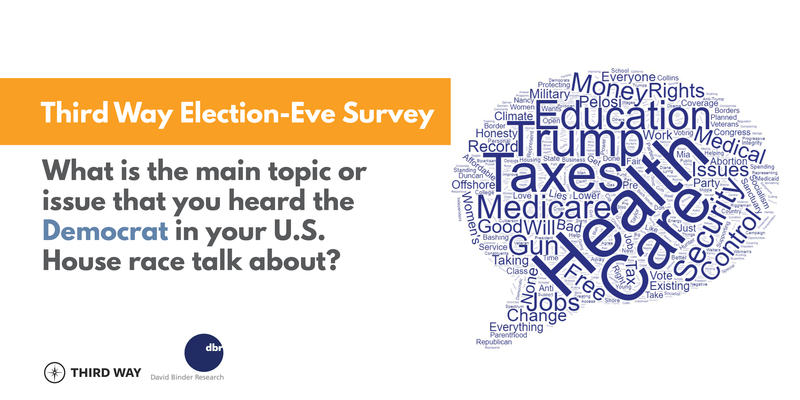 When we gave respondents an open-ended question on the main topic they heard from the Democratic candidate running in their district, health care dominated. And this message discipline worked. Voters who prioritized health care backed Democrats by 44 points. This wasn’t just a Democratic wave election, it was a mainstream and moderate Democratic wave election. The data from the election-eve poll shows it, and even more conclusively, so do the victors. The fact that voters prioritized health care this year was not surprising. But because the country is engaged in a real debate over the best path forward on health care—with alternatives ranging from repealing Obamacare to protecting and expanding it to establishing a single-payer “Medicare for All” system—we dug a level deeper to understand what message voters were sending on health care with their vote. 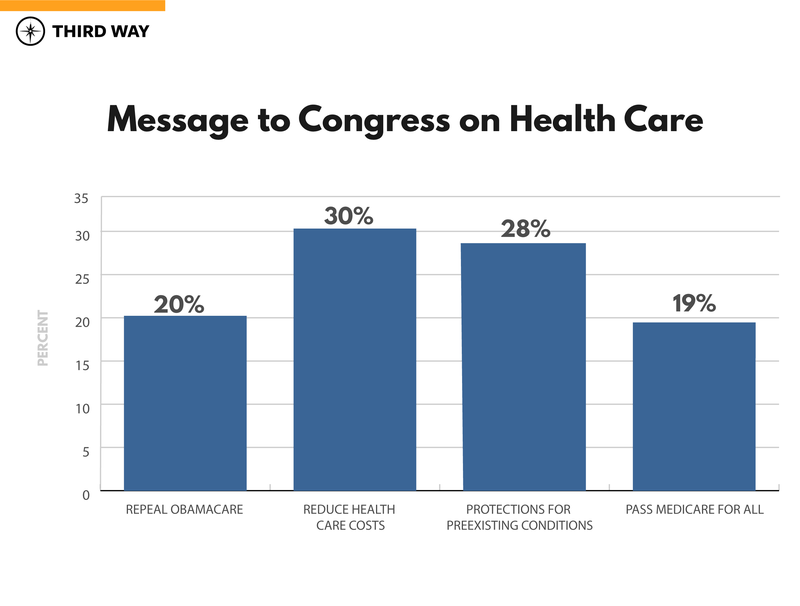 Reducing costs (30%) and protecting coverage for preexisting conditions (28%) dominated, making up a combined 58% of voters’ message on health care, while passing Medicare for All (19%) lagged behind repealing Obamacare (20%). Democratic voters overall, as well as the key constituencies of women, people of color, and young people, all prioritized reducing costs or protecting preexisting conditions over passing Medicare for All. Voters who said health care was one of the top issues in deciding their vote prioritized both reducing costs and preexisting conditions over Medicare for All. And just 17% of newly registered voters this year listed Medicare for All as the message they wanted to send on health care. Clearly, Medicare for All was not voters’ (or Democrats’) priority in 2018. But because it is a major topic of discussion within the progressive movement, we tested how support fared after voters were exposed to boilerplate Republican attacks. 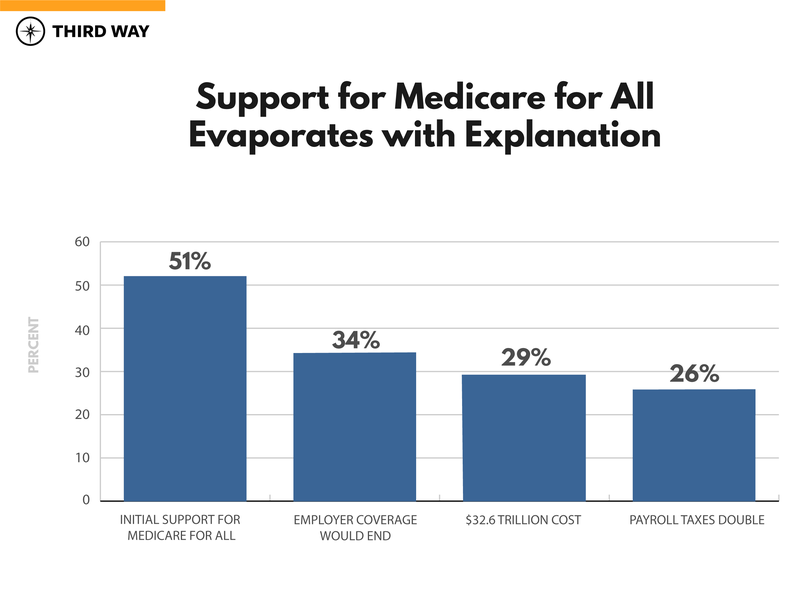 While only 19% of voters said their message on health care this year was to pass Medicare for All, 51% initially indicated they’d support such a proposal, with 25% strongly supporting it. But when these same voters were told that Medicare for All means employer-provided health care would end, support plummeted by 17 points to 34%. When presented with the estimated cost of $32.6 trillion over ten years, support dropped further to 29%. And when voters were told payroll taxes would double, support fell to 26%. No wonder Republicans in at least two dozen of these swing districts made this their central line of attack. Finally, in a separate battery of questions, we asked voters if they would be more likely to vote for a candidate who supported keeping and improving Obamacare, creating a new single government plan that would cover everyone, or repealing Obamacare. A wide plurality, 39%, favored improving Obamacare, while 31% preferred repealing Obamacare, and just 24% picked a single government plan. Among Democrats, 55% preferred a candidate who supported Obamacare compared to 37% for a single government plan. Thankfully, the mainstream Democratic candidates who were running in the majority-making districts focused on health care affordability and access in the general election and totally ignored Medicare for All. In fact, Third Way staff watched all 967 ads run by Democrats and their allies in the DCCC’s Red to Blue districts since Labor Day and found that 50% of all ads focused on preexisting conditions. By comparison, only two of 967 ads referenced Medicare for All, and both of those candidates lost. Voters in these battleground areas are not sold on Trump for 2020. In fact, only 37% said they would definitely vote for him, while 52% said they would definitely vote against him. Two years out from Election Day 2020, those numbers are soft. However, it is fair to say there is significant skepticism about a second Trump term. But what is a winning Democratic coalition looking for in a 2020 candidate? We asked Democrats and Independents a series of forced-choice questions to find the answer. In simple terms, they want a uniter who will offer a bold new agenda to improve the lives of Americans. Democrats and Independents in these battleground districts preferred a fresh perspective (45%) over someone with extensive government experience (38%). Eighty-eight percent wanted someone who would work across party lines to bring the country together; just eight percent wanted a candidate who will be uncompromising in pursuit of their policy goals. Fifty-seven percent picked someone who will mend, not end, capitalism, compared to 17% who wanted a Democratic Socialist. Ultimately a majority, 52%, wanted a candidate who can beat Trump, while just 40% preferred a candidate who mimics their own policy preferences. And 70% of Democrats and Independents said they want the Democratic Party to appeal to a broad range of voters, including those who voted for Trump in 2016, in order to win future elections. 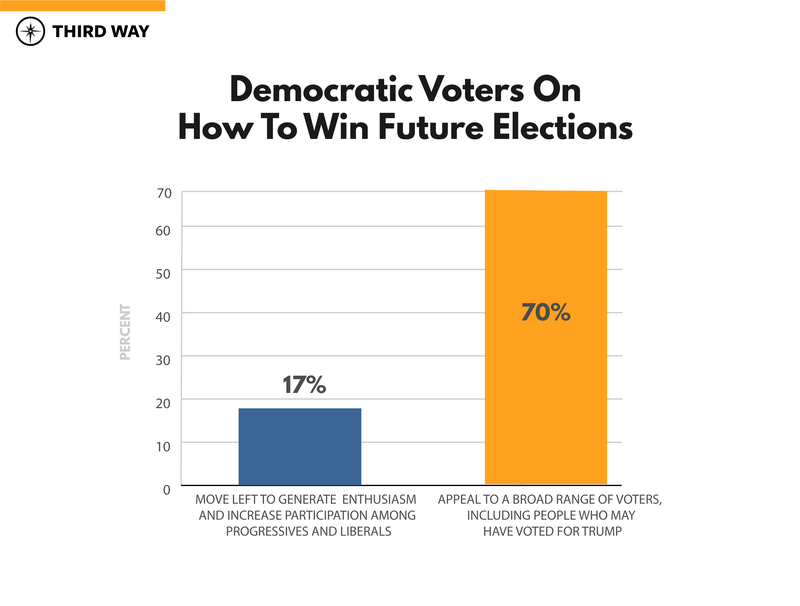 Just 17% said Democrats should try to win future elections by moving left to generate enthusiasm and increase participation among progressives and liberals. On this same question, women preferred a broad coalition approach over moving left by 51 points, people of color by 31 points, and those under age 35 by 26 points. Even those who had participated in a protest over the last two years, the visible face of the resistance, favored a broad path forward by a 43-point margin. Voters in these battleground places are hungry for a bold agenda to move the country forward. But to understand why, it is necessary to acknowledge that there is an opportunity crisis in America. More than twice as many voters said earning a good life in their community is getting harder than the number who said things are getting easier where they live. And by a 13-point margin, more people said a young person in their community could find more opportunity by moving elsewhere than by staying close to home. Seventy-two percent said hard work is very important to getting ahead in life. Fifty-eight percent of Democrats and Independents said they wanted a 2020 candidate who would focus on expanding opportunity to more people and places, while 31% prioritized someone who would focus on reducing income inequality. Last week's election was an important step toward taking back our country and moving it forward. And while winning the House does put a check on Trump, it does not dispatch with him. Still, this election offers a cogent blueprint for winning back the White House in 2020. Democrats won with a coalition that was as diverse as our country. In our election-eve poll, the predominantly mainstream and moderate Democratic candidates running in the battleground districts led with women by 14 points, voters of color by 35 points, and those under 35 by 15 points. These candidates had overwhelming support with self-identified Democrats, but they also led by nine points with Independents. And they matched Republicans’ support with high school graduates while winning college graduates by seven points. These data and the election results show that voters gravitated to and voted for a diverse slate of pragmatic progressives who centered their agenda on core issues like health care. Voters resoundingly rejected leftwing policies like Medicare for All. And looking towards 2020, voters want Democrats to build a broad and diverse electoral coalition so that Trump goes down, not by a smattering of votes, but by an electoral landslide. To create this coalition, Democrats need a bold agenda rooted in Americans’ lived experience—one centered on the concept that we should all have the opportunity to earn a good life no matter who we are or where we live. On the weekend before Election Day, Third Way and David Binder Research conducted an election-eve online survey in the 72 battleground US House districts rated as “Lean” or “Toss Up” by the Cook Political Report as of late October. Democratic and Republican candidates were referred to by name in the survey. The 2,428 sample was made up of voters who had voted early or who indicated they were certain to vote. Respondents were drawn from state voter lists and a voter-matched panel.